Doreen Lawrence is a long-standing supporter of the Show Racism the Red Card Campaign and visited our North East headquarters on Thursday, 2nd August. 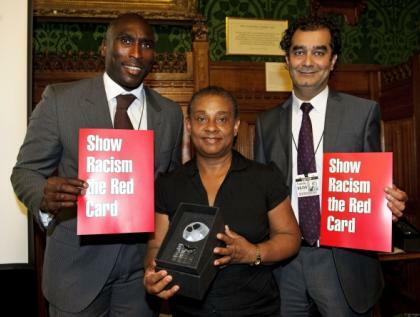 Show Racism the Red Card welcomed Doreen into our Hall of Fame last September, in tribute to her inspirational work in the field of race equality and her fight for justice following the racist murder of her son, Stephen. As part of her visit, Newcastle City Council hosted a Civic Reception in her honour. The Lord Mayor welcomed Doreen, before the Leader of the City Council paid testament to her dedication to human rights and her fight for justice for the victims of racially motivated crime. Following the reception, Show Racism the Red Card and the Stephen Lawrence Educational Trust benefitted from a fundraising event "A Night of Fashion". This evening was kindly organised by local businesses I Am Models and Machine Lad and hosted by Tup Tup Palace. The Fashion Show was a huge success and included a champagne reception, live band, and charity raffle. All proceeds from the evening are shared by Show Racism the Red Card and the Stephen Lawrence Educational Trust. "We are really excited that Doreen Lawrence is visiting the North East. She is truly an inspiration to all of us in the field of anti-racism. I am sure that those attending the reception will be looking forward to hearing Doreen speak. "I am hugely grateful to the local businesses who have come together to organise A Night of Fashion - it is overwhelming the support they have offered and the number of people wanting to be involved. This is a clear reflection of the respect and admiration that Doreen holds."